Volleyball comes from the United States and is almost world-wide. The World Volleyball Federation FIVB represents 218 nations, with around 35 million players. If you want to know more about the rules of the Volleyball game then read the full article. Volleyball is a team sport from the group of non-return game, when facing two teams with six players on a network shared by a pitch. The aim of the game is a ball (the volleyball ) without aids on the net on the floor of the opponent's half to play and to avoid that like the enemy succeeds, or force the opposing team in an error. A team is allowed the ball (in addition to the block ) three times in a row to touch, to play it back. The volleyball court is 18 meters long and 9 meters wide, so that each team plays on a field half with 9 × 9 meters. The box halves are separated by a network, whose height (top of the net) for men 2.43 m, 2.24 m is in women's and Mixed 2.35m. It consists of dark brown or black linen thread and is 1 m wide and 9.5 to 10 m long, so that stick out inches on each side 25-50 on the sidelines of the field. The posts attach to the network are therefore not attached to the sideline, but 0.5 to 1 m outside the field (at international pageants, 1 m). For better visualization of the vertical page boundary are fixed directly on the side lines of two bands at the net. In each rod protrudes a (so-called antenna ) 80 cm high over the net. The antennas must not be touched, and serve as the left and right border, within which the ball must be played over the network (theoretically extended to the top). The network must be allowed to slack, because power is touched by the ball is not an error and the ball must be played even after rebounding from the net. In three feet distance to the grid are parallel to the centerline of the attack lines. Only front-row players (see team ) may attack within this zone (area between the center line and attack lines), and the ball at the moment of hitting is completely above the height of the net carrying over the net. Players must play behind the ball in the front zone just below the edge network on the net or hit the ball to bounce behind the line of scrimmage. However, the landing may be in the front zone. 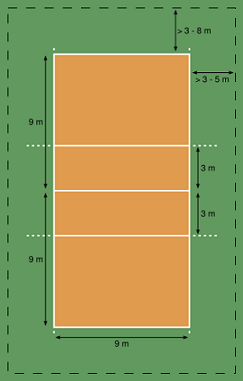 Around the actual playing field must contain a minimum of three meters wide zone be kept free, in which the ball may also be played. For games in the hall a total of eight meter high roof is recommended, without interfering obstructions (eg basketball hoops) in space. In the official game operation, given the limited capabilities of many smaller clubs in lower leagues from the volleyball federations fewer demands made ​​on the premises than in the higher leagues. The way the game called volleyball was until 1998 one color and light since then and may also consist of a combination of colors. He is outside of seamless, lightweight padded leather with an air-filled rubber bladder inside. With a size of 65 to 67 cm and a weight of 260 g to 280, the volleyball is smaller and significantly lighter than a basketball or football . The internal pressure must be from 0.300 to 0.325 kg / cm ². The brand of the game balls will be determined by the Volleyball Association for the domestic market. There are several approved international range balls, which differ in small details in color and material texture. The general principles regarding the scope and weight are the same. A team consists of ladies' and men's teams from six to twelve players. The six players who are in the starting line-up is referred to as a starting player or even "Starting Six". The starting lineup of the team determines the rotational order of the players on the field (see graphic at right), which is valid for the duration of the sentence. The players in positions 2-4 is called a front-row players, the position 1, 5 and 6 back-row players. Team captured a right to serve rotate so their players at one position clockwise. This example puts the player who previously was on position 2 on the network, now in position 1, becoming the server for his team. This position in the (own and enemy) keeps the team in charge until after they lost the right to serve this recaptured again. While this rotation system ensures that each player during the game consistently all positions (in order ... - ... 6 - 5 - 4 - 3 - 2 - 1 - - 6) will be running in the league in general played with fixed distribution of tasks. This is possible because the teams must take the prescribed list only on impact. Once the ball leaves the hand of the Server, the players may be in accordance with the tasks assigned by the coach position on the field. Only when the rally is finished, they must think again before the next serve their correct position according to the rotational order. The respective front-row players must stand before his counterpart in the backcourt, so players must stand 2, for example, before player 1. Likewise, the respective front and back up players according to the order. For example, a player must stand right next to players 6th The players' positions are determined by the feet. For every front-row player must be a part of one of his feet closer to the center line than the hind feet of each player. Each player must be outside at least closer to a part of his foot on the sideline than the center of each players turn. Typically, the tasks in a team of two middle blockers, two outside assailants and (depending on the tactical game system) two setter or a setter and distributed a diagonal players. The main tasks of the middle attacker / -blockers are the blocking game and the fast attack through the center (position 3). The outside attacker / blocker / acceptance-player attacks from the left side of the field from the block placed on its side of the field (position 4) and assumes. The diagonal player acts as a mirror ("diagonal") for their own playback devices. He takes over the task of opposing block attack (the enemy 4) and usually takes the back of player to.In the higher divisions of the diagonal is usually the main player attackers - especially in the men's area. It is rarely used in the adoption and always takes on the position 2 or 1. In the lower divisions of the diagonal player is often used as a secondary player device, leaked to the balls, which adopted such as the setter. The use of diagonal player depends greatly on the quality of the adoption team and the skills of player off because the players only by diagonal "upside-scan" can be used effectively. Players who are at the beginning of the rally in the back field (positions 1, 6 and 5) are usually also entrusted with specific tasks and therefore change as soon as possible after the service provided on their rear field positions. The libero is a defensive specialist and acceptance. He may - from anywhere - run attack strikes only when the ball is below the top of the net. After passing the upper (ducts) in the attacking zone, the opponent's attack also can not run above the network edge. This also applies to attacks from the back of the field. If, however, its top passing behind the line of scrimmage are, no restrictions in the attack. The libero also can not perform a block or block and attempt to run a premium. The position was codified in 1998 in the rules. The player is distinguished by a different colored jersey from the rest of the team. As a universal players such players are called, may be responsible for their skills with a variety of different tasks and therefore used in different positions (usually with the exception of the Libero position and tape). In competitive volleyball, there are various game systems. Three of them are the 4-0-2 system , the 4-2 system and the 5-1 system .Set and six substitutes per team are allowed. Start and substitute thereby form a solid, "exclusive" tandem, ie, once a player was substituted for another, it can be replaced again only for this (so-called reverse exchange ), with the exception of the libero. After that is exhausted in this sentence for these two players change the quota, with the result that the first player to play the sentence and make the replacement player until the next set on the bench must. It may be used after his substitution did not start for another player. An exception to these provisions is, however, in the event that a player is injured in play and can not continue playing. Regardless of the Libero must be on the three backcourt positions as often as one and replaced.On the team sheet for each team's place for the registration of twelve players. In addition to the six starting players may therefore sit on the bench for more than six players and are used. Four (or two) line judges. In addition, there can still be an assistant of the writer, for example, uses a scoreboard with the score.The first referee stands or sits on a referee's stand side of the net. His field of vision must be about 50 cm above the grid. The second referee stands on the opposite side of the net. Schreiber and assistants are sitting at a table behind the second referee. The linesmen are located one on each corner of the playing field, with two line judges at diagonally opposite corners. *In the second half of 1895, by William G. Morgan, a sports director of the YMCA in Holyoke , a game called Mintonette developed as a pastime for older members. It was regarded as a gentle alternative to basketball, the 16 km in Springfield was created four years ago. The sport hall contained characteristic elements of tennis and handball. Morgan himself wrote the first rules. They saw a 25 × 50 feet in front of (7.62 × 15.24 m) wide field and a 6 ​​ft, 6 inches (1.98 m) high net. The number of players was as unlimited as the number of ball contacts allowed. Failing that, it was like in tennis serve a second attempt. *At a conference of all the sports directors of the YMCA in Springfield, at the beginning of 1896, the game was introduced, and in 1952 only slightly modified, name Volley Ball proposed and accepted. The rules were changed slightly. *In the following years, the sport spread over Canada (1900) in the whole world. It was during the First World War, introduced by American soldiers in Eastern Europe, where he became a very popular sport. Until the mid-20th Century it spread throughout the continent. Many techniques and tactics that characterize the modern volleyball were introduced by European teams. Examples include the Block (are Czechoslovakia, 1938), the 5-1-system of the USSR, the excavators ( Czechoslovakia, 1958) and the attacks from the back row ( Poland, 1974). *The leading nations are Brazil, Russia, the USA, Italy, Japan, Poland and Cuba. Join China in the women's volleyball and Serbia in the men's volleyball. According to estimates by the FIVB participate now a sixth of all people worldwide actively or as spectators at the volleyball. *The international federation, the Fédération Internationale de Volleyball (FIVB) was founded in 1947. Since 1963, there is the European federation, the Confédération Européenne de Volleyball (CEV). The German Federation (DVV) exists since 1955. In the Bundesliga since 1957 is determined, the German champion. World Championships are held since 1949 (men) and 1952 (women). Volleyball since 1964 is an Olympic sport. The variant Beach volleyball has been recognized by the FIVB in 1986 and officially belongs to the Olympic program since 1996.